The year 2012 has started out in strange ways. While celestial forces augur for rare tail events, the assurance of man-made events that stretch far into the extreme tail of probability are not only very likely but will be of a type to reflect the change in the global balance of financial power. The Paradigm Shift mentioned over the course of the last two to three years is at work, having moved into a higher gear. The gold is moving from the West to the East, along with the power. We will not see the process reverse in our lifetime. The sanctions set against Iran have been devised by a former global leader nation that is beset by insolvency, fraud, and lost integrity. 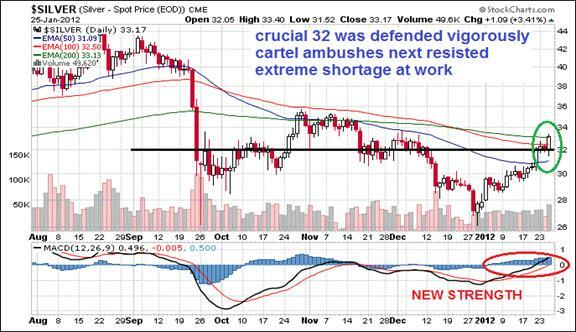 The backfire has consolidated forces into a more fortified position against the USDollar. Trade increasingly is not being settled in US$ terms. The icons of the day are mere apologist public address systems attempting to rationalize and justify the deep insolvency and wrecked systems. The new normal is of a caravan file of broken cars and trucks sputtering down the road, using the false fuel of hyper monetary inflation and the offensive paint of phony financial accounting, the tell-tale sign being the ugly rancid smoke out of their tailpipes. The last insult is of the US Presidential election process, which is badly marred by obvious inconsistencies and anomalies. The vote count for the candidate that attracts the biggest crowds, attracts the biggest donations from corporations, and defies the financially teetering system does not match the final official tallies. Backfire extends to Europe, where the absence of Iranian oil supply will cause some extreme problems. The shortages are soon to be acute, word coming from a German source with great contacts in the middle of the mix. He wrote this morning, "The Persians are cutting off oil shipments to Europe, effective immediately, which will kill Greece, Italy, and the other Club Med deadbeats. 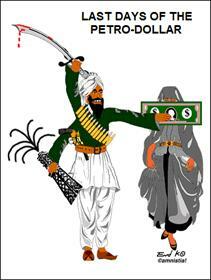 The West with their sanctions led by the Americans screwed itself royally. The Asians and others are dis-engaging from the Western banks as fast as they can. 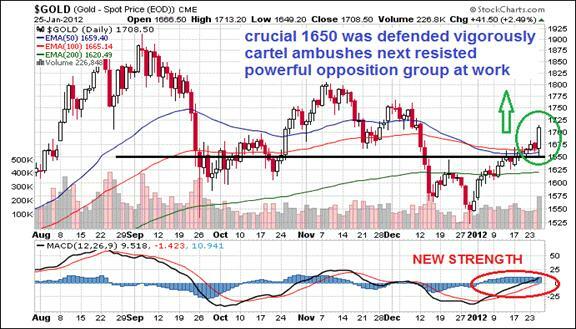 Expect to see more wild fluctuations in the Gold and Silver prices continue. Until this week, the Gold forces did not know how weak the Anglos already are. They have hardly any firepower left." Difficult decisions will be made toward the USGovt leadership. It is shaky. It is lacking integrity. The nation is smeared by the splatter of fraud. Its markets are propped by the heavy hand of daily interventions. Its economic data is laughed at as a fantasy. Its elite are given huge grants without global approval. Its central bank makes decisions unilaterally, without conferring with USGovt creditors. The foreign anger is ripe. The motive to seek alternatives is at high pitch. Big changes are in progress, pushed along ironically by the USGovt itself. If their spokesmen insists on the many major global trade participants to take sides, the crew in WashingtonDC might be in for a shock, colored by isolation. The real loser will eventually be the USDollar, whose Petro-Dollar defacto standard is being washed away by central bank liquidity and leadership arrogance. 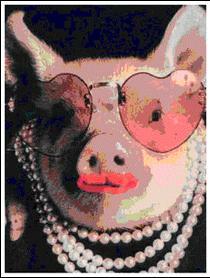 The US financial body resembles a pig adorned with lipstick with each passing day. It is hard to describe fully the lost ways of the US Federal Reserve. The phrase New Normal is a transparent attempt by financial icons in the private sector to put a face of legitimacy on a system bound in the USDollar and its heavy handed management, reinforced by a daisy chain of $trillion frauds. Such cannot be done. The term was coined by Mohamed El-Erian, from the PIMCO helm. Bond fraud followed by TARP Fund fraud, followed by Financial Accounting fraud, followed by Mortgage Contract fraud, followed by unauthorized multi-$trillion fraudulent grants by the USFed, followed by the grand sequence Quantitative Easing to wash value out of the USDollar, followed by the unilateral undercut to USGovt creditors, followed by more unilateral decisions to sanction Iran for nuclear weapon development that even Defense Secretary Leon Panetta admits is not a reality, well, does not make for global leadership. It makes for a travesty. Yesterday the USFed released more directives. So the USEconomy is stuck in a weak reverse gear. The accommodation will extend until year 2014. These guys are basic liars. Even Bill Gross of PIMCO takes shots at the central bank policy or ruin. The United States will suffer financial repression (in Gross's words) if the Federal Reserve implements additional bond monetization as policy. The USFed will hold its benchmark interest rate at near 0% for at least the next three years, as a testament to central bank failure. No departure from the 0% rate can be done. The USGovt debt service requires it, demands it, and will default without it. The ZIRP and QE are worn as badges of failure and dishonor. Good riddance to Geithner. Timmy the Tool is nothing but a mechanic, a diminutive figure from the Wall Street club, nothing in stature like his predecessor Paulson. If truth be told, the Chinese probably ordered him out of office, after far too many ridiculous meetings on Beijing soil. Timmy's battle cry of currency manipulation had grown tiresome. The laughter given him by university students two years ago was too much to stomach, when he claimed the US financial structures were strong and sound. Let's watch to see if the next Treasury Secretary is of Goldman Sachs pedigree. Its firm death grip on American bank rule has been evident since Rubin in 1994. Few seem to realize it is all downhill toward ruin since that fox took control of the American henhouse, jumping the pond from the London Gold desk of Goldman Sachs. The eggs are gone and the hens are sterile. All that is left is cartel droppings.